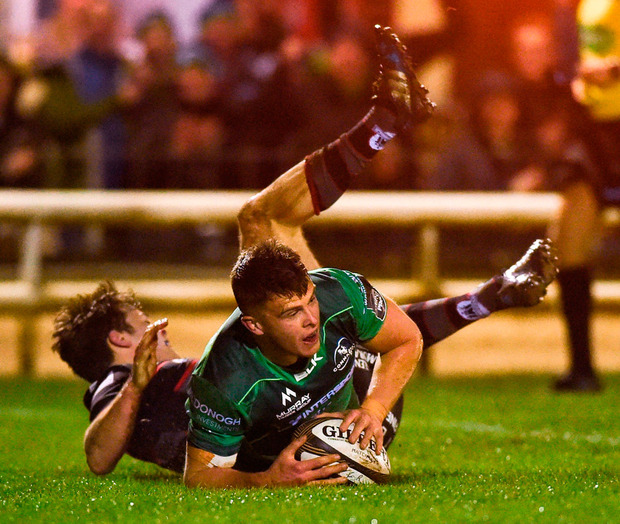 Finlay Bealham looked to have rescued Connacht but they prepared for their Challenge Cup quarter-final with a disappointing defeat to in-form Edinburgh at the Sportsground in the Pro 14. Edinburgh had victories over Leinster, Ulster and Munster in recent weeks and a late try from impressive replacement Duncan Weir secured the win. Connacht were 17-13 ahead at the interval after first-half tries from Tiernan O'Halloran and Tom Farrell in the dreadful conditions for rugby. The hosts still chose to spread the play on every occasion but Bealham grinded out their third try which looked to have them safe, only for Duncan Weir to seal the win for Edinburgh. 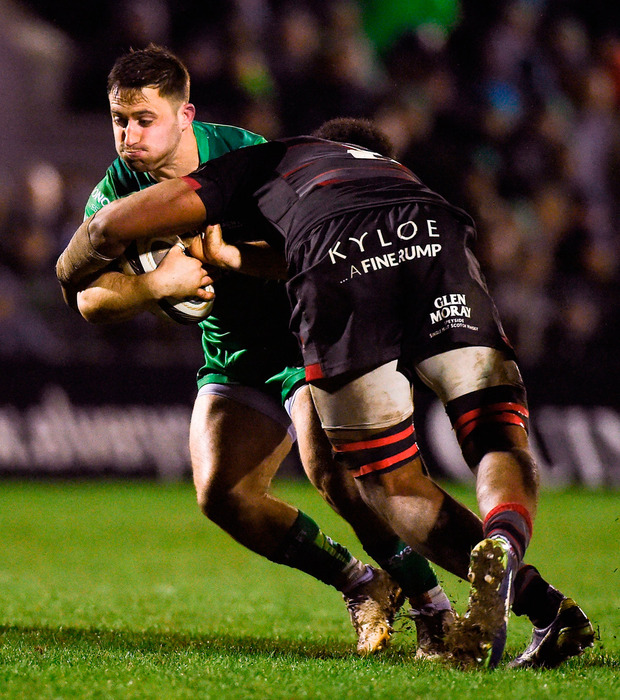 Kieran Keane's side welcome Gloucester to the Sportsground next weekend but they made a desperate start here when the visitors scored, almost directly from the kick-off. O'Halloran's attempted clearance was blocked down by openside flanker John Hardie, and when Caolin Blade and Matt Healy hesitated, Dougie Fife dived on the ball to score. Edinburgh out-half Jaco van der Walt missed the conversion but he made amends with a penalty before Connacht finally began to find their cutting edge in attack. Connacht's first try arrived in the 12th minute when Blade found Eoin McKeon before his pass was latched onto by the on-rushing O'Halloran. Carty added the extras and played a crucial role in Farrell's try, his step created a hole in the cover and he put his inside-centre through with the pass. Carty was unerring from the tee again but Connacht's defensive frailties were exposed in the 23rd minute when Duhan van Der Merwe out-paced Niyi Adeolokun to score down Connacht's right wing. Connacht had suffered a last ditch 26-25 defeat at the hands of Cheetahs in Bloemfontein last time out but Carty slotted his third kick for a 17-13 lead at half-time. Edinburgh got back within a point when replacement Weir scored but Bealham's hard-earned try in the 66th minute relieved the pressure. Craig Ronaldson missed the conversion and Edinburgh replied with Weir's try in the 74th minute. 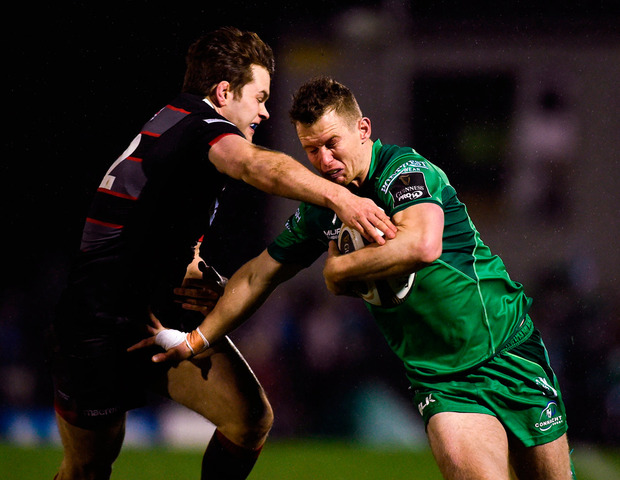 It was Edinburgh's sixth win in a row, sealed when Weir kicked another penalty at the death. Connacht - T O'Halloran; N Adeolokun, E Griffin (D Leader 69), T Farrell, M Healy; J Carty (C Ronaldson 62), C Blade (J Mitchell 62); D Buckley (D Coulson 71), T McCartney (D Heffernan 71), F Bealham (D Robertson McCoy 71); G Thornbury, Q Roux (J Cannon 78); E McKeon (E Masterson 70), J Butler, S O'Brien. Edinburgh - B Kinghorn; D Fife, M Bennett, C Dean (P Burleigh 30), D van der Merwe; J van der Walt (D Weir 60), N Fowles; D Marfo (J Lay 40), N Cochrane, S Berghan (WP Nel 49); B Toolis (L Carmichael 57), G Gilchrist; M Bradbury, J Hardie, B Mata (C du Preez 62). REF - George Clancy (IRFU).